Maybe you’ve considered all kinds of approaches to your company’s next television or online commercial: songs, dances, puppies, supermodels, children, and so on. But have you ever thought about dinosaurs? As soon as a mighty dinosaur appears on your viewers’ screens, they’re sure to be transfixed. They’ll almost certainly watch the entire ad. 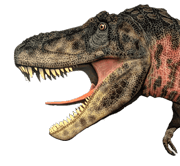 And, as a result, your message will resonate in their minds as powerfully as a T-Rex’s roar. Consider a 2015 Coca-Cola advertisement that aired in China. It opens with a terrified man running through a forest. A bellowing T-Rex follows in close pursuit. At last, the poor fellow reaches a clearing, where he conveniently finds a cooler full of Coca-Cola bottles. He grabs one, turns around, and holds it up. Instantly, the fearsome dinosaur begins acting like an eager puppy: panting, drooling, and wagging its tail. Clearly, it craves some Coke. How about this elaborate FedEx ad? A caveman ties a stick to a pterodactyl’s leg and watches it fly away. Unfortunately, a T-Rex promptly swallows this winged reptile. Thus, that caveman must go tell his boss that the package didn’t make it. When the boss asks him if he used FedEx, he tries to explain that the company doesn’t yet exist. Alas, things don’t turn out well. First, this employee is fired. Then, after he kicks a small dinosaur in frustration, a huge leg crushes him. Those two ads combine humor and realistic visuals to briefly take viewers into a different world. They stand out because consumers all over the world are fascinated by these prehistoric animals. Just as the runner in the first ad and the hapless cave-worker in the second try to make connections with dinosaurs, people of all ages would love having meaningful encounters with such beasts. In short, these commercials offer thrills and originality. Plus, they pique people’s curiosity since, nearly the whole way through, viewers are left wondering what kind of item is being promoted. At this point, whether you’re selling cars, deodorant, or something else entirely, you might have a question: How could I get a sweet dinosaur into my next ad? Well, you can count on My Dinosaurs. Among many other options, this company can supply you with an animatronic T-Rex or a dinosaur costume. Both products offer a wide range of details and lifelike movements. All you’ll have to do is shoot a commercial that features an exciting or amusing encounter with one of these monsters. Soon enough, you should find that a large number of dinosaur fans have become fans of your brand. This entry was posted in Showcase, Uncategorized and tagged animatronic dinosaur, animatronic dinosaur costume, dinosaur for commercial use, realistic dinosaur costume, realistic dinosaur model.